Prose details on the build itself and the ammo I designed will follow. 8.2 lbs in home defense trim, loaded. 28.5" OAL, 26.5" to end of bbl threads. Looks nice. I have a similar set-up. I like the two tone look, hate quad rails though. I agree on the quad rail. CDNN has a great deal on LWRC rails which are the ones that I chose to go with on my build. 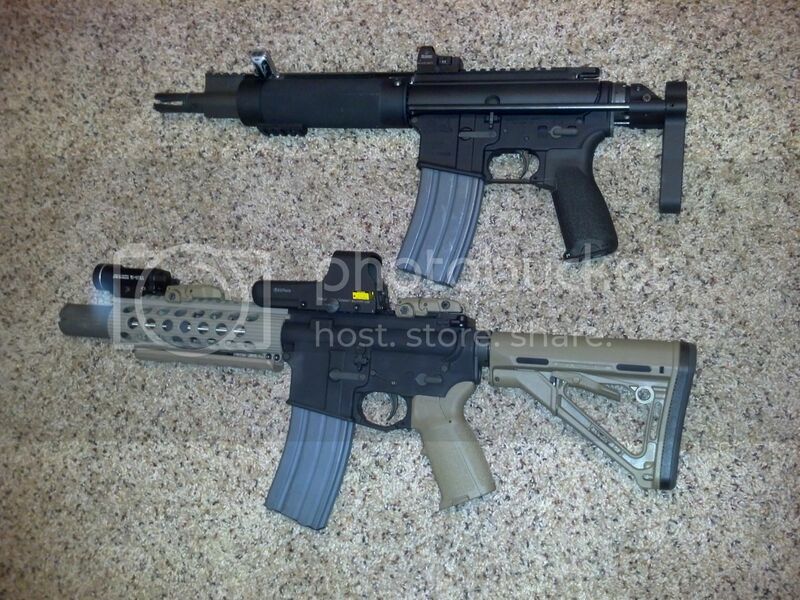 $90-100 are fantastic prices for a quality quad rail handguard. I had a LWRC midlength a while back, but decided it was too heavy and opted for a modular handguard. 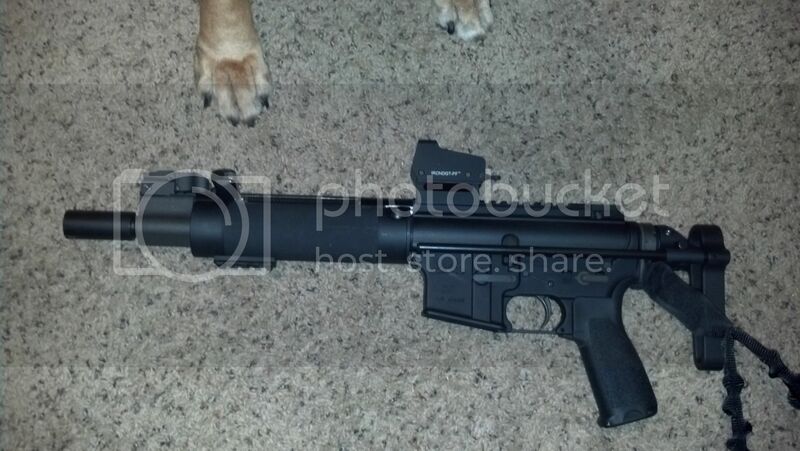 My currently pistol build is getting a Samson EVO 7" for a 8" 300BO. Where'd you get that rail? Lower right pic. I am curious of the forward charging handle of the SBR with the Nordic CRS. That's an ARMS Swan Sleeve for an AR10. Built my own bufferless upper with a non-reciprocating charging handle. Spend the extra $200 if you can. You lose the whole "compact" thing when the brace is on there. 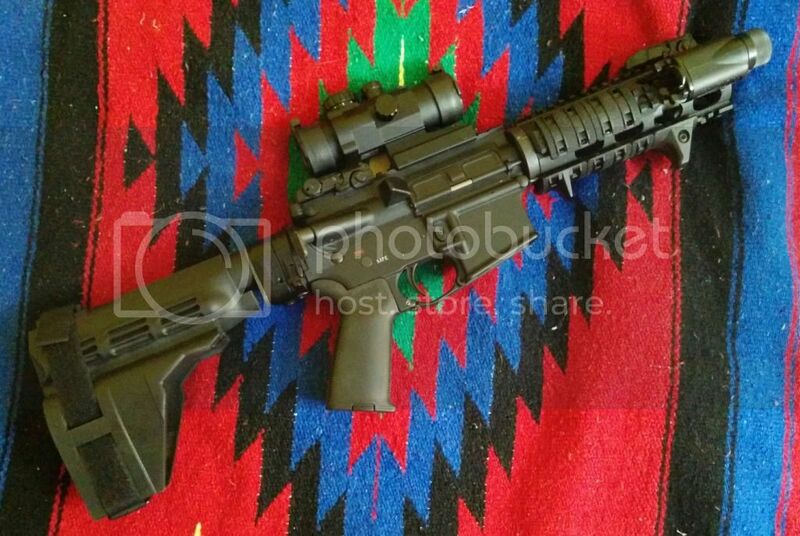 10.5" seems kinda long for a "PDW." Seems most factory PD dubs are 7-8." Loop must be located low enough so the screws don't hit the tube! Measure FIVE times, cut once. I think I used 1.5" #8 dark plated screws from the hardware store. threaded aluminum piece, etc. Then it hit me - good ol' JB-Weld. Love that stuff. Just kept glommin' it in until it went under and over the screws. SB-15 tends to rotate on the tube. IMHOP you really must glue it on. carry my firearm comfortably to the range. aluminum, so I figured what the heck, it couldn't hurt. I keep the wrench in the grip. Any reason you reamed them by hand instead of using the drill press / jig? isn't too shiny. May leave it as-is. start with anyway. I find the grip shown to be very natural. add rails only where I need 'em, etc. certainly use a chucking reamer in it. over their nominal size. More with bigger bits if your press is like mine. Be glad you don't have the old style 80% where you had to tap the buffer tower, I paid about $60 for that tap, and I would hate to have to ream and tap it without a mill. a friend's mill - an old but still solid Bridgeport BTW, beautiful piece of equipment. part of the whole weapon that's always bothered me - just not enough meat. to be in that tower area. Solution: pay more and get a good billet lower! Much less likely to happen in a forging compared to one of the crappy cast 80% lowers that still pop up from time to time. 2000 chars per post to start. would have meant a new caliber or specialized cartridge (or both). It also meant different, more expensive, tougher to get spare parts. that percolation is presented here for your consideration. purpose. Easy to build any sort of upper you like. I needed to come up with a suitable 5.56 variant for the ammo. that's his current self-imposed logistics chain. be the best goal, since the result may be overly-penetrative. effects of firing 5.56 inside a home. armor while retaining enough energy to stop the perp. buffer springs, lightweight oddball buffers, etc. has a steel core and has been deemed armor-piercing by BATF. the round will penetrate when fired from the P90's 10.5" barrel. what I see with my own eyes. any more but it's what I have. pistol-SPECIFIC powders in a rifle cartridge. SS197 cartridge (40gr V-Max, 2100fps, 392 ft-lbs). ...so I didn't even bother to keep going after this point. 100 rounds or so of testing, I could no longer reproduce the fault. they came out at a slight angle to the rear and 6 - 7 feet out. You have the ugliest feet. effects of firing a rifle inside a home. You need a flash can. How are you liking that light? ETA - might have to put it on a riser of some kind because sliding it backwards to come off the mount would interfere with any rail panels - hence you can see the rail behind it is bare. using the SB15 configuration I wanted. natural with the AFG2 (for me anyway). Condition 1 anyway, the utility of the bigger handle may be moot. The Vortex just plain flat works. The real deal. .300 Blackout 125gr ballistic tip just might be the ultimate house gun. I tried posting in the SB15 thread but goofed somehow and it ended up here. Vortex instead. (See multi-part writeup). Doesn't mean I won't try one at some point! With the flash can the blast is also directed forward rather than out to the side so if your partner is beside you less cutting gas hitting them. 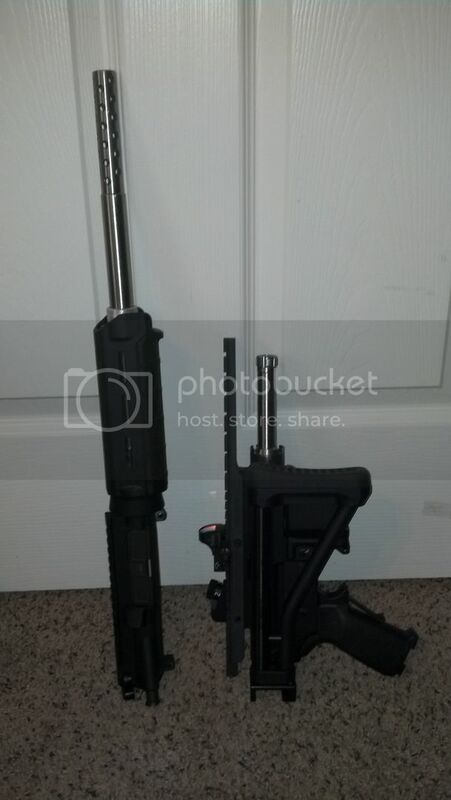 By the way mine is in 300 Blackout and I intend to experiment as you suggested with various subsonic rounds for HD. My barrel is 8.5 inch. I'll be HIGHLY interested to hear what happens. Is your shorty hard on the case rim? If not you may be half there already. diameter of .308 so all sorts of bullets are out there. I wonder if anyone makes a 100gr .308 ballistic tip? pressure signs, while lowering blast and flash. technical, you just don't know until you try. It's a bummer, but I think IMR is discontinuing 4759 yet again as of next year. I say "yet again" because I think they've yanked it at least twice already and brought it back when enough people squawked. Personally I'd go with lighter weight components and suppressor. And move the weapon light to 12:00. That question has already been answered with the Barnes 110gr TSX load that expands down to 1300fps, Leaves at over 2300 from a 16" barrel, but doesn't give up much down in the 8-9" barrel range. Here's my solution. 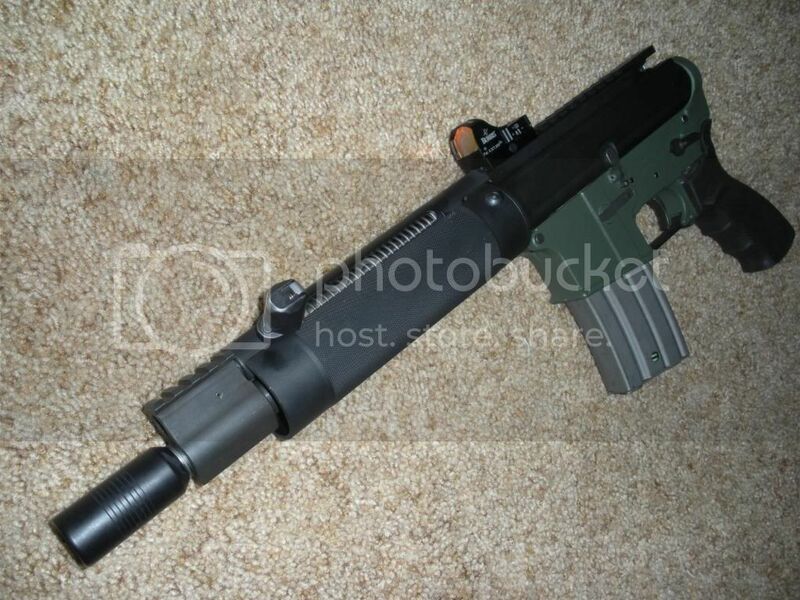 7.5" 5.56 w/ a STD brake on it and a LAW folding adapter. So do I. The price and the PITA to disassemble it is why I only have one.